Ruth Bogutz, president of the Tri-County Jewish Historical Society welcomes visitors to the new photo exhibit, "Camden Remembered." Larger photo. search of the past as well as the future of a city that was once the center of their universe. 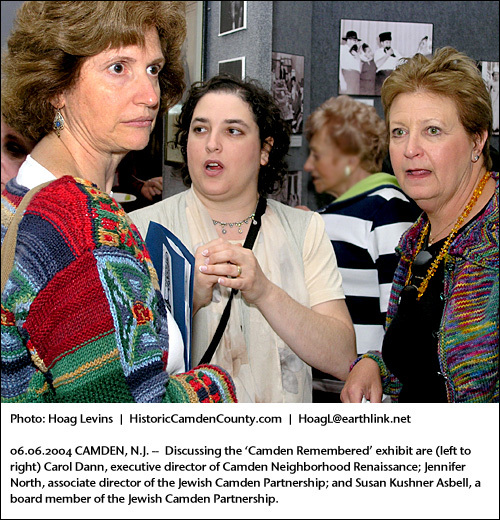 The occasion was the opening of the "Camden Remembered" photo exhibit assembled from the archives of the Tri-County Jewish Historical Society. The photos in Boyer Auditorium of the Camden County Historical Society's headquarters on Park Boulevard will remain on display through the end of July. The exhibit was funded, in part, by the Jewish Community Foundation. "I really got goose bumps when I walked in here and saw the photos like this," said Ruth Bogutz, who heads the Tri-County Jewish Historical Society and collected the pictures that were on display. "I hadn't looked at these images together in quite a while and I'm just amazed by the power of what they show," she said. 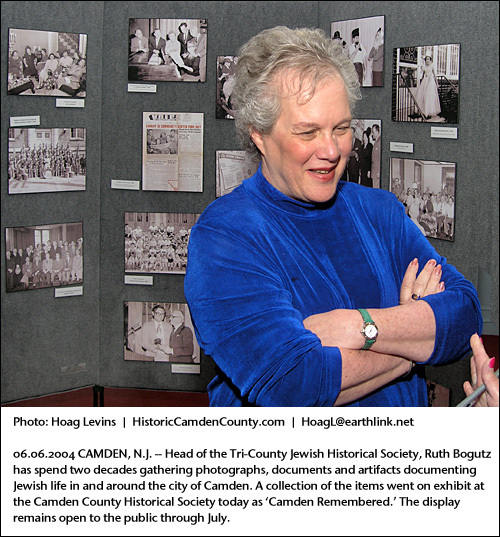 Bogutz, who is also the executive director of the Camden County Cultural and Heritage Commission, first began gathering the documents and artifacts of Jewish Camden in the early 1980s. But what began as a small project for the "Shared Memories" program at the Jewish Geriatric Home in Cherry Hill never ended. Two decades later, she is still scouring the attics, basements, scrapbooks and storage rooms of Jewish homes and institutions throughout Camden, Burlington and Gloucester counties to locate and acquire local 20th-century Jewish memorabilia. "I am obsessed with this period of history and what happened here," said Bogutz, who grew up in the city's golden age as the center of regional Jewish life. "Camden was so special," she said. "There was such a sense of place and such a comfort in knowing who you were and where you belonged." 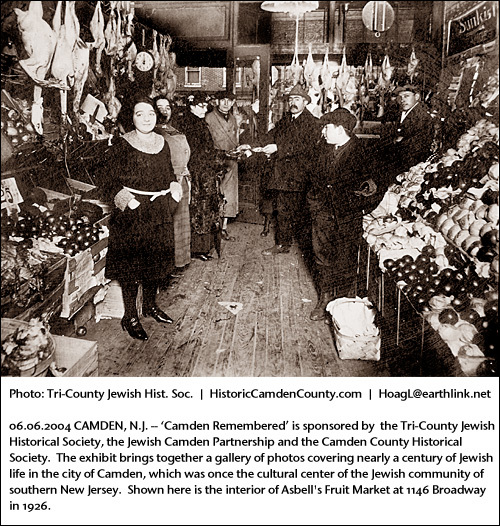 One image from the 'Camden Remembered' exhibit is of the interior of Asbell's Fruit Market at 1146 Broadway in 1926. Larger photo. interior of shops lit by gas lamps and thick with inventories of pot-bellied coal stoves, wicker baby carriages and fresh-plucked poultry hung from the rafters. Others captured dapper clerks waiting on well-heeled customers at the jewelry counters of Pinsky's Department Store at Broadway and Spruce Street on its opening day in 1924. There were trolleys moving down Broadway amidst sidewalks busy with shoppers and curbsides lined with those square-topped, bulbous-fendered black sedans of the late 1930s. There were four dozen serious-looking gentlemen in double-breasted suits -- all members of Rabbi Riff's Bible Class -- lined up on the front steps of the Sons of Israel synagogue on 8th Street in 1944. Other pictures captured the members of Camden's first Jewish Nursery School class in 1948 and elderly residents facing off over checker boards at the Golden Club in the Talmud Torah building on Kaighn Avenue in 1950. The homey era documented in the exhibit largely ended in the 1960s when the businesses, families and synagogues moved away from the increasingly blighted city to Cherry Hill and other surrounding suburbs. Speaking in the Boyer Auditorium of the Camden County Historical Society, Jewish Camden Partnership executive director Nancy Axelrod called for a supportive return to the city. Larger photo. Not just a tour down memory lane. photos. Most of the nearly 90 people in the first wave of visitors had either lived in Camden or were related to people who lived there. 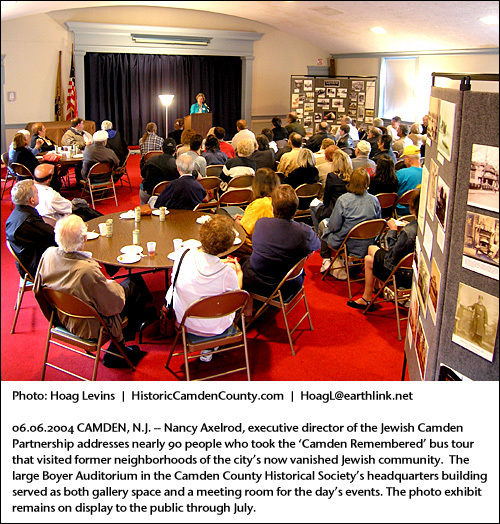 However, from the podium, Nancy Axelrod, executive director of the newly-formed Jewish-Camden Partnership that organized the event, pointed out that her group's day-long program also included a bus tour and stops in former Jewish neighborhoods throughout Camden and that the overall purpose was "not just a walk down memory lane." The Partnership, formed six months ago, is designed to foster new cooperative relationships between the Jewish community in the suburbs and the inner-city groups and institutions now working to reinvent Camden, backed by new infusions of government grants and redevelopment funds. The bus tours were aimed at physically reconnecting interested Jews with the nostalgia of their families' neighborhoods as well as the gritty current realities and needs of a city that, by the late 1970s, had become one of the nation's poorest and most beleaguered urban areas. It was a recruitment drive for people interested and willing to directly involve themselves with Camden's destiny. The Partnership's associate director, Jennifer North, reflected that, "As I've been listening to all these testimonials and looking at all the pictures and learning about all the Jewish businesses and how concentrated they were up Kaighn Avenue and Broadway and Marlton Pike, I think about how quickly the Jewish community left for the suburbs. I think about how devastating the loss of that many concentrated businesses must have been on the economy of Camden. And I really can't help but think about how much the Jewish community facilitated Camden's decline -- along with other people, of course. It's not just the responsibility of the Jewish community but I think we really need to take the opportunity to have a hand in bringing Camden back." Discussing the exhibit are (left to right) Carol Dann, executive director of Camden Neighborhood Renaissance; Jennifer North, associate director of the Jewish Camden Partnership; and Susan Kushner Asbell, a board member of the JCP. Larger photo. "I think about how devastating the loss of that many businesses must have been." social action committee. Her Jewish-Camden Partnership group is now searching for office space to set up shop somewhere in Camden. "The three primary avenues we see for the Jewish community to get more involved in Camden is volunteerism, investment and advocacy," she said. "Volunteerism meaning that individuals can volunteer to help neighborhood groups that need an accountant or lawyer or architect or engineer. We can make a match with someone in the Jewish community who wants to help and has the needed expertise." "In terms of investment," she continued, "the state has really had a focus on bringing investment into Camden, and there will be an opportunity for Jewish community members to invest in commercial properties and bring their businesses back into Camden." "And in terms of advocacy," she said, "we really don't want to put Band-Aids on things. We want to try to deal with the root causes. That can be done through legislation and by helping neighborhood groups to look at broader issues and broader problems that can be addressed with longer range thinking and vision." Despite her overall no-nonsense, business-like demeanor, North, who helped select the images and oversaw the creation of the actual "Camden Remembered" exhibit, at times seemed pulled into the emotion of the display. "As I worked with these photos," she said, "I saw more clearly than ever that that old community along those Camden streets was a very intimate one. Families knew each other for three generations and everyone took care of everyone else's children. When someone was sick, help simply showed up. Oh, we know each other now out in the suburbs, but it's not the same. We are 'acquainted' but it's not like back then when everyone really knew each other along Kaighn or Haddon Avenue. I think what this photo exhibit has made me see is that when the Jewish community moved away from Camden, it lost as much as the city did."